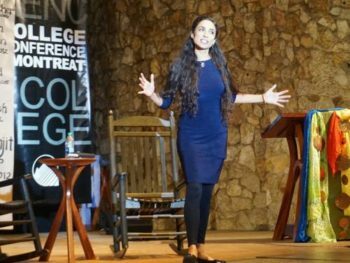 At the conclusion of Valarie Kaur’s Jan. 4 electrifying keynote address at the College Conference at Montreat, the tandem lines on either side of Anderson Auditorium were at least ten deep with students all but on fire to have her respond to their questions. In fact, “fire” was an operative word for Kaur, an American interfaith leader, lawyer, filmmaker, Sikh activist, and founder of The Revolutionary Love Project based at the University of Southern California. She had so galvanized the conference by charging her listeners “to have the courage to walk through those flames of hatred and bigotry and rage, and love anyway,” that attendees were eager to stay well beyond Kaur’s allotted time just to remain in her presence. The 2017 conference entitled, “Beyond Babel,” based on Genesis 11:1-9—for which over 1,000 college students and their advisors gathered from Jan. 2–5—was designed to help participants see in the ancient biblical text “how God gave an ancient people a holy nudge towards diversity,” while at the same time challenging them to consider how God is similarly nudging God’s people today. During the Q&A that followed Kaur’s presentation—when she became aware that the evening’s next event was already past schedule—she asked the gathering, in an act as gracious as it was personal, for its permission to hear each of the remaining unanswered questions, learn the names of those already in line, and then answer all of them in one single response. As if by magic. Although Kaur had no wand nor sword like Harry Potter, she did have a camera. Drawing strength from a lesson she learned from Harry Potter—which resonated powerfully with her college audience—she reminded her listeners that Harry wasn’t the strongest or the smartest, but he was brave, and he didn’t do it alone. He was protected, just as she said she is “shielded by love” through ancient Sikh scriptures, and her hearers through the Christian scriptures. Kaur, who had opened her presentation by sharing the story of her son’s birth—during which her mother had whispered to her laboring daughter those selfsame words, “You are brave”—again invoked her son. What she witnessed was a story of forgiveness and reconciliation at the site of her uncle’s murder in Mesa, Arizona, on September 15, 2011, between her uncle’s younger brother, Rana, and her uncle’s murderer, Frank Roque, whom they decided to call in prison. Kaur closed her presentation by reminding her listeners that revolutionary love is not the absence of anger—there is a role for anger in social change work.